I love meeting people and speaking to them. That is the best way to learn and grow. 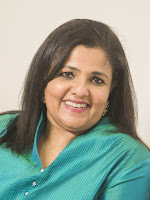 Recently I was speaking to Anna Chandy. She is also well known for working closely with Deepika Padukone and heading The Live Love Laugh Foundation. I am a certified trainer ,supervisor and counselor by profession.I have three main areas that I focus on private practice,training in organisations and also run groups with a focus to maximize psychological potential. I am passionate about mental well being as I believe mental well-being is the spring board required for an individual to leap into the universe and maximize his true potential to lead a fulfilling satisfying life. I recognized my passion when I had reached a point of status quo and confusion in my life. It was a stage that I was exploring various aspects and opportunities as I had hit a ceiling and was feeling trapped and caged! I am driven from my inherent passion and psychological energy from within.I believe that I am destined for success,dignity and joy. bullied as a 12 year old and said that after attending one of my workshops at that time ,his outlook as a 12 year old itself helped him use adversity to go forward and become successful. My work in the area of Mental health which has a stigma is changing through the work of The Live Love Laugh Foundation which I chair.Today TLLLF has begun the conversation on mental health to reduce mental health. TLLLF launched the first nationwide mental health media campaign. I face challenges of peer envy because I am considered very successful. I believe that this is natural and reflects nothing about me but them. I interpret challenge as an opportunity for learning so I am not scared by it. My biggest achievement is to date is the ability to believe in myself ,my abilities and my capabilities . Happiness is a process and not the end result.In my view success can be an element of happiness but happiness is within . Yes I do because I feel happy irrespective of the current issues or context in my life journey. 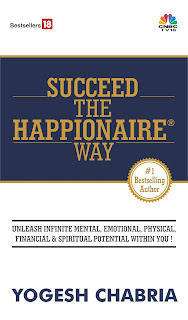 What do you think of The Happionaire Way? I appreciate the focus of the Happionaire Way. Thanks Anna and wish you all the best! Quote interesting to read about Anna. Thanks for sharing this Yogesh and do recall how brave it was of Deepika to come out and share her inner fears and demons. I'm in America, is this the same Deepika who is acting with Vin Diesel? Did not know she had depression earlier...very nice to know what you did for her Anna. I am curious to know what method you used for her? Anna's story is quite motivating. Deepika padukone do whatever it is become a big news for her fans and others.